From May 1984: MARVEL UK's RETURN OF THE JEDI weekly celebrates fifty issues (and almost a year in print) with a blue elephant and a free glossy booklet, C.Y.R.I.L's DATA FILE, full of photos and saga-related facts. And - oh look - they've reused the ROTJ US Superspecial cover art yet again. 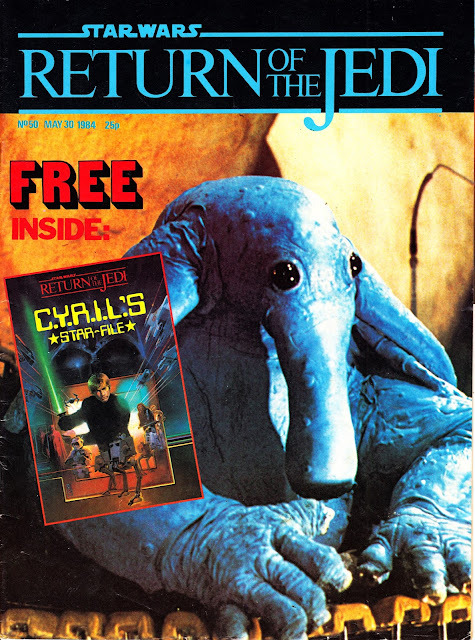 Despite being the magazine's 'Editor Droid', C.Y.R.I.L had yet to make his visual debut in the comic... that was still a few more months away. The 'character' himself first appeared, as a letters page gimmick, back in the days of STAR WARS WEEKLY in the late Seventies. ROTJ weekly itself was still in its first phase of mixing new (chopped into very short chapters) and vintage (sometimes with some weird paginantion) Marvel Star Wars strips (sadly nothing new was ever commissioned for this run) along with vaguely related movie adaptations as the third feature (at this point: JAMES BOND: FOR YOUR EYES ONLY. Next up: KRULL). The British Bullpen had only just got around to clearing the backlog of pre-JEDI US material (a reversal of the one-time situation where the US colour monthly was reprinting strips already published in the British edition) and was now - finally - relating events after the fall of the Empire. The cherry-picked SWW era reprints were about to give way to another outing of THE EMPIRE STRIKES BACK adaptation the following week, the first time the strip had seen print in the UK since 1980. ROTJ eventually ran for 155 issues (plus specials) before succumbing to falling sales and the decline in the saga's popularity. The strip ended its days as a back-up feature in SPIDER-MAN AND ZOIDS before fading away (although the spin-off DROIDS and EWOKS strips, based on the animated shows, continued to appear across the British range). the pick n mix of both pre and post jedi stories must have been confusing for first time readers, not to mention veteran fans.
" the years between empire and jedi were not easy years for the rebel alliance. " Was there ever a time when the rebels DID have it easy ?